Amado was the 2017 and the 2015 Canadian National Champion Sr Stallion and Gold Medal Movement winner. He was Reserve Champion in both 2017 and 2015 in the Champion PRE Stallions, All Ages class. We were OK with that because in 2015 his 4 month old son, VA San Paulo, was the Champion and in 2017 our other stallion Norteño Rey MA was champion. 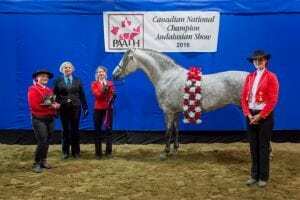 San Paulo was also the Canadian National Supreme Halter Champion which is a repeat performance from 2013 when Amado’s son, VA Alejo was the Supreme Halter Champion. Coming from a long line of National Champions, both in North America and in Spain, Amado is a National Champion in his own right. Amado was shown in 2010 and was pronounced US National Reserve Champion Colt, 2 years and under, when he was only six months old. On Amado’s topside, his sire is Canadian National Champion Senior Stallion, Mystique’s Manolete. Manolete has won over 20 National titles in both performance and halter. His grand sire is Sandokan who was US National champion Jr. 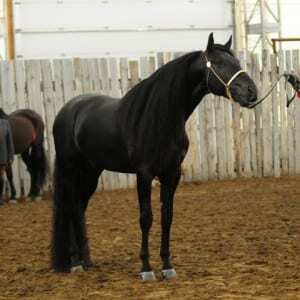 Stallion in 2003, Reserve National Champion Sr. Stallion in 2006 and winner of numerous National performance titles. His Great Grand Sires were Molinete IV and Navarre GF, both multi-national title holders. On Amado’s bottom side, his dam is US and Canadian National Champion Estampa MA. His Grandfather is US National Champion Ocioso VIII, producer of more national champions than any US sire to date. He also has Leviton, Hosco and Genio III in his long list of champion forefathers. Amado had his first foal crop in 2013 with phenomenal results. His 2013 son, VA Alejo, was shown at 3 months of age at the Canadian National Andalusian show with Judge Sue Burkman of Santa Barbara, California presiding. She pronounced Alejo to be the Supreme Halter Champion of the entire show. Her words were “This colt is gorgeous, I mean absolutely gorgeous”. In 2015, Amado’s son VA San Paulo was pronounced the Supreme Halter Champion under Hall of Fame inductee judge Mr. Richard Petty. Not only did he pick a 4 month old colt to be the best of show but Mr Petty actually walked over to the microphone to comment to the audience on the “outstanding quality of this colt!”. In 2016 Amado’s yearling filly, VA La Reina and his weanling filly, VA La Luna Elegante were the National and Reserve National Champion Filly, 1 year and under. Triana is a 2010 grey Canadian National Champion Andalusian mare. Her dam is our US National Champion mare, Inez VW. 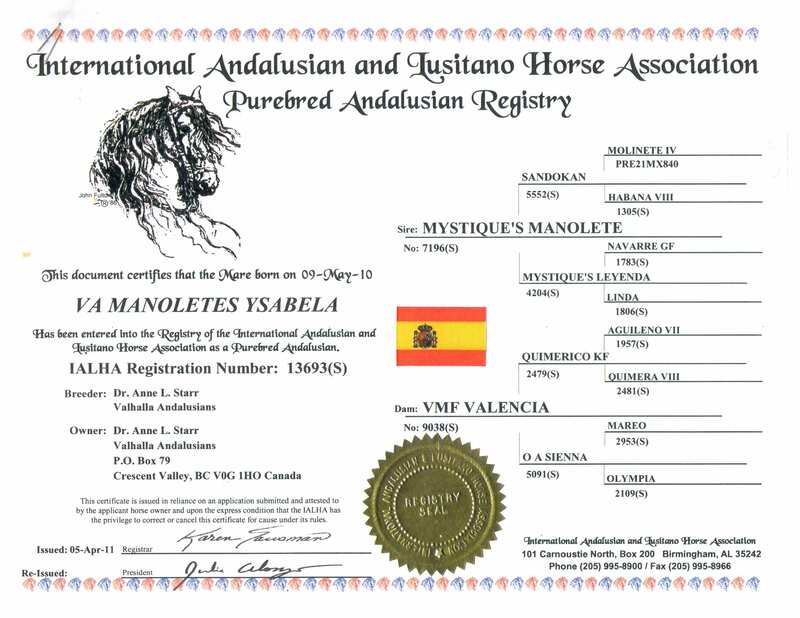 Her Sire was our Canadian Multi-national Champion sire, Mystique’s Manolete. Triana has been an incredibly easy horse to handle. She was easily started under saddle this year and has been a joy to ride. Her conformation is outstanding and her movement compelling. She was shown at the Canadian National show in 2011, 2012 and 2013. In 2011 Triana was the National Champion Filly, 1 and Under, National Champion Filly, 2 and Under, Reserve Champion PRE Mares, all ages, and Reserve Champion Andalusian Mare, Amateur to Handle. In 2012 she was the Reserve National Champion Filly, 2 years old. In 2013 she was National Champion Jr Mare, 3 & 4 years old, National Champion Andalusian Mare, Amateur to Handle. In 2015, Triana outdid herself at the Nationals by tying with Estampa MA for High Point Andalusian/Lusitano Horse for the entire show. See her show results below. She is quite accomplished for such a young mare. In 2015 we welcomed a gorgeous colt from Triana by Mystique’s Padrino. Thank you Triana for your beautiful gift. VA Aragon is an amazing young boy. In 2017 Triana gave us a lovely filly by Escamillo – VA Sueño De Ayer and in 2018 she had a stunning filly by our stallion Norteño Rey MA – VA Cortesa. Heaps of movement with that filly. Ysabela is a 2010 National Champion PRE grey Andalusian mare. Her dam is our multi-national Champion mare VMF Valencia and her sire was our multi-national Champion stallion, Mystique’s Manolete. Ysabela did very well at the 2016 National Show winning the coveted title of National Champion Andalusian Best Movement in a class of 15 horses. She was also Reserve National Champion Andalusian Sr Mare (a close second to her sister VA Manolete’s Triana who was the NC). 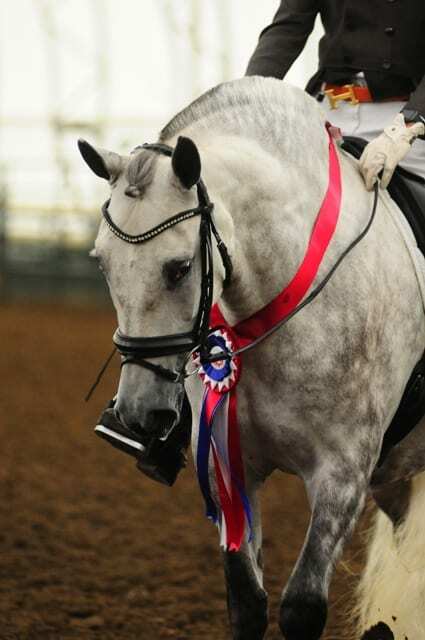 In 2011, Ysabela was the National Champion filly, 1 year and under and Reserve National Champion Filly, 2 and under. In both of these classes she was also the Gold Medal Movement winner. This girl is a real mover and an outstanding dressage prospect. In 2017 we had Ysabela in a Juan Manuel Muñoz Diaz clinic and he said that Ysabela had the best walk he had ever seen on an Andalusian….ever!!!! He was also very impressed with her trot and canter. Ysabela gave us a beautiful filly in 2014, VA Mi Poca Manzana. (Sold) and an amazing colt in 2017 by Escamillo – VA Ardiendo, who has also been sold. Ysabela competed in her first big dressage show! She was Reserve Champion Training Level Open at the Thunderbird “Touch of Class Show” in Langley, BC. Congratulations to our trainer Kaylyn Steinhauer for doing such a fantastic job. VA Sadean is a gorgeous 2010 bay 3/4 Andalusian filly. Her sire is our national champion stallion VMF Agosto and her dam is our Half Andalusian mare VMF J-lo. Sadean was named after our BFF’s Sadie and Dean who were living with us at the time of her birth. They were so excited to discover her newly born in her stall that we felt that calling her Sadean was the right thing to do. She was sold at 6 months old to one of our trainers Michelle Maliska-Young.